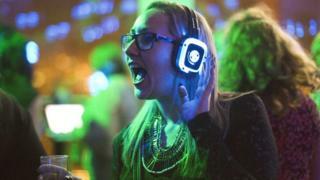 The Swiss city of Lausanne has banned outdoor silent discos, saying that they are too noisy. Event organisers had hoped to hold two silent discos - where music is relayed to headphones worn by participants rather than be played on loudspeakers - on rooftop terraces in the Flon area of the city, The Local news website reports. However, after taking on board complaints from residents following earlier silent discos, Lausanne's business regulation department turned down the application for the parties which would have let revellers dance in silence until 5 o'clock in the morning. Speaking to the Swiss 20Minutes news website, Olivier Meylan, director of the For Noise Festival which had previously held silent discos in Lausanne, said: "Given our experience in the neighbouring district of Pully, we could have tried at least one test in the centre of Lausanne and then make an assessment, but no!" Unfortunately for the organisers, it appears that officials listened to the complaints of locals who said the events are not as silent as advertised, a concern aired by the Austrian city of Salzburg in 2014. Florence Nicollier, head of the department responsible for issuing licences in Lausanne, told 20Minutes that "during silent discos, the noise caused by the clientele is not negligible." The problem, The Local says, is that participants can't help singing along to the music. The department's decision on singing partygoers is final, and can't be appealed.